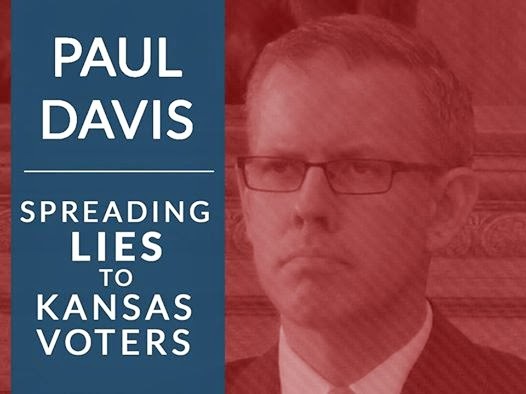 Kansas GOP Insider (wannabe): There's a Davis Meme! I don't think this meme will be very effective, however. Maybe over Davis' face, it should say -- "Brownback added jobs" and "School spending increases under Brownback." Or even a "Tell Davis to stop spreading lies about the Kansas economy and school funding..."
To just say Davis is lying isn't quite enough. To low-information voters, it looks like name-calling. Don't get me wrong. I think it's OK to make jabs, but I don't think the correct response to a jab is another jab. It's a block, which requires giving voters the truth as well as telling them it's a lie. However, the meme is a thousand times better than that million-page email blast, which I'm sure was read by tens of Kansans. I think this is just one more example showing how bad Republicans are at messaging. It's pretty embarrassing. The Brownback campaign is a complete disaster. It's sad too, because he's a good man and Davis is, while a nice guy, uber-liberal. It's really sad.